Providing you the best range of red garnet chain necklace and labradorite beaded rosary chain with effective & timely delivery. We are providing Red Garnet Chain Necklace products to our clients. 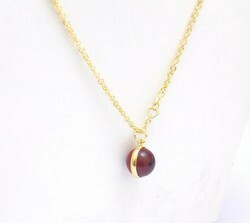 Red Garnet Chain Necklace With Gold Plated. We Deal with All Type Of Fashion Jewelry Like Earrings, Stud Earring, Bracelets, Necklace, Pendants, and Ring Etc. We Provide Best Quality With Cheap Rate. We Also Offer Customized Jewelry according To Customer's Needs. You Have Any Particular Design Then Send Us We Will Make. We are waiting For Your Positive Reply. And If You Have Any Issue Regarding Price or Quality Then we can discuss.